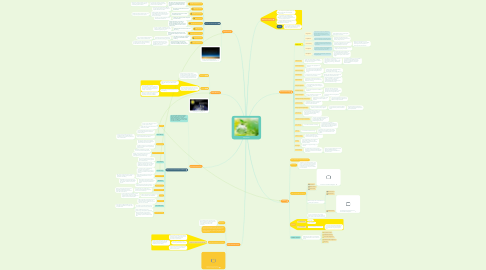 This is a structured overview on the topic Ecology. It involves the branches of ecology, pollution, environmental issues and science, such as global warming and climate change. 1.1. The study of how organisms interact with one another and with their physical environment. 1.2. The distribution and abundance of organisms on Earth is shaped by both biotic, living-organism-related, and abiotic, nonliving or physical, factors. 1.3. Ecology is studied at many levels, including organism, population, community, ecosystem, and biosphere. 1.4.1. One core goal of ecology is to understand the distribution and abundance of living things in the physical environment. 2.1.1.1. Organismal ecologists study adaptations, beneficial features arising by natural selection, that allow organisms to live in specific habitats. 2.1.1.1.1. These adaptations can be morphological, physiological, or behavioral. 2.1.2.1. A group of organisms of the same species that live in the same area at the same time. 2.1.2.1.1. Population ecologists study the size, density, and structure of populations and how they change over time. 2.1.3.1. A biological community consists of all the populations of different species that live in a given area. 2.1.3.1.1. Community ecologists focus on interactions between populations and how these interactions shape the community. 2.1.4.1. An ecosystem consists of all the organisms in an area, the community, and the abiotic factors that influence that community. 2.1.4.1.1. Ecosystem ecologists often focus on flow of energy and recycling of nutrients. 2.1.5.1. The biosphere is planet Earth, viewed as an ecological system. 2.1.5.1.1. Ecologists working at the biosphere level may study global patterns interactions among ecosystems, and phenomena that affect the entire globe, such as climate change. 2.2.1. It deals with ecological study of different habitats on planet earth and their effects on the organisms living there. 2.2.1.1. According to the kind of habitat, ecology is subdivided into marine ecology (oceanography), estuarine ecology”, fresh water ecology (limnology), and terrestrial ecology. 2.2.1.1.1. The terrestrial ecology in its turn is classified into forest ecology, cropland ecology, grassland ecology, desert ecology, etc., according to the kinds of study of its different habitats. 2.3.1. Problems of niche segregation and speciation. 2.4.1.1. microbial ecology, mammalian ecology, avian ecology, insect ecology, parasitological, human ecology and so on. 2.6.1.1. Wild-life management, range management, forestry, con­servation, insect control, epidemiology, animal husbandry, aquacultare, agriculture, horticulture, and land use and pollution ecology. 2.7.1. The ecological study of the processes of soil formation, nutrient cycline energy flow, and productivity. 2.9.1. Energy conservation and its flow in the organisms within the ecosystem. 2.9.1.1. In it thermody­namics has its significant contribution. 2.10.1. The factors of environment have a direct bearing on the functional aspects of organ­isms. 2.10.1.1. The survival of populations as a result of functional adjustments of organisms with different ecological conditions. 2.11.1. The adaptations of animals of preferences of particular organisms like insects to parti­cular chemical substances. 2.12.1. An ecologist recognized kind of genetic spasticity in the case of every organism. 2.12.1.1. In any environment only those organisms that are favored by the environ­ment can survive. 2.12.1.1.1. Genecology deals with the study of varia­tions of species based upon their genetic potentialities. 2.13.1. The study of environmental conditions, and life of the past ages, to which palynology, palaeontology, and radioactive dating methods have made significant contribution. 2.14.1. The study of geographical distribution of animals (zoogeography) and plants (phytogeography), and also of palaeoecology and biomes. 2.15.1.1. The development of partially or completely regene­rating ecosystems for supporting life of man during long space flights or during extended exploration of extra-terrestrial environments. 2.16.1.1. The study of soils, in particular their acidity, alkalinity, humus contents, mineral contents, soil-types, etc., and their influence on the organisms. 2.17.1. The study of gross effects of radiations and radioactive substances over the environment and living organisms. 2.18.1. It is the interpretation of animal behaviour under natural conditions. In it, often, detailed life history studies of particular species are amassed. 2.19.1. The study of ecology and ethology of mankind. 3.1.5.1. Satellite observations reveal that the amount of spring snow cover in the Northern Hemisphere has decreased over the past five decades and that the snow is melting earlier. 3.1.6.1.1. The rate in the last two decades, however, is nearly double that of the last century and is accelerating slightly every year. 3.1.8.1.1. The number of record low temperature events has been decreasing, since 1950. 3.1.9.1. Since the beginning of the Industrial Revolution, the acidity of surface ocean waters has increased by about 30 percent. 3.1.9.1.1. This increase is the result of humans emitting more carbon dioxide into the atmosphere and hence more being absorbed into the oceans. 4.1.1. Global warming is the term used to describe a gradual increase in the average temperature of the Earth's atmosphere and its oceans, a change that is believed to be permanently changing the Earth’s climate. 4.2.1.1. Warming that results when the atmosphere traps heat radiating from Earth toward space. 4.2.1.2. Certain gases in the atmosphere block heat from escaping. 4.2.1.2.1. Long-lived gases that remain semi-permanently in the atmosphere and do not respond physically or chemically to changes in temperature are described as "forcing" climate change. 4.2.1.2.2. Gases, such as water vapor, which respond physically or chemically to changes in temperature are seen as "feedbacks." 5.1. The environmental problems like global warming, acid rain, air pollution, urban sprawl, waste disposal, ozone layer depletion, water pollution, climate change and many more affect every human, animal and nation on this planet. 5.2.1.2. Industry and motor vehicle exhaust are the number one pollutants. 5.2.2.2.1. Causing melting of polar ice caps, rise in sea levels and also unnatural patterns of precipitation such as flash floods, excessive snow or desertification. 5.2.6.1. It occurs due to rise in global warming which occurs due to increase in temperature of atmosphere by burning of fossil fuels and release of harmful gases by industries. 5.2.7.1.1. Eco systems, which took millions of years to perfect, are in danger when any species population is decimating. 5.2.8.1.1. Deforestation simply means clearing of green cover and make that land available for residential, industrial or commercial purpose. 6.3.5. Pollution of all kinds can have negative effects on the environment and wildlife and often impacts human health and well-being. 7.1.1. Environmental science is the study of the effects of natural and unnatural processes, and of interactions of the physical components of the planet on the environment. 7.3.1. What Does an Environmental Scientist Do? 7.3.1.1. Environmental scientists conduct research to identify, control, or eliminate sources of pollutants or hazards affecting the environment or public health. 7.3.1.2.1. Collecting and analyzing air, water, and soil samples; analyzing environmental data gathered by others; and analyzing for correlations to human activity. 7.3.1.3. Environmental scientists also develop plans to prevent, control, or fix environmental problems like air pollution.